The inside of a tube which is bent into a circular arc (the so-called Bourdon tube) is connected to the vacuum system. Due to the effect of the external atmospheric pressure, the end of the tube bends more or less during the evacuation process. This actuates the pointer arrangement which is attached to this point. The corresponding pressure can be read off on a linear scale. With Bourdon gauges it is possible to roughly determine pressures between 10 mbar (7.5 Torr) and atmospheric pressure. This vacuum gauge contains a hermetically sealed, evacuated, thin-walled diaphragm capsule which is located within the instrument. As the vacuum pressure reduces, the capsule bulges. This movement is transferred via a system of levers to a pointer and can then be read off as the pressure on a linear scale. In the case of the diaphragm vacuum gauge which is capable of absolute pressure measurements, a sealed and evacuated vacuum chamber is separated by a diaphragm from the vacuum pressure to be measured. This serves as the reference quantity. With increasing evacuation, the difference between the pressure which is to be measured and the pressure within the reference chamber becomes less, causing the diaphragm flex. This flexure may be transferred by mechanical means like a lever, for example, to a pointer and scale, or electrically by means of a strain gauge or a bending bar for conversion into an electrical measurement signal. The measurement range of such diaphragm vacuum gauges extends from 1 mbar (0.75 Torr) to over 2000 mbar (1500 Torr). The pressure sensitive diaphragm of these capacitive absolute pressure sensors is made of Al2O3 ceramics. The term “capacitive measurement” means that a plate capacitor is created by the diaphragm with a fixed electrode behind the diaphragm. When the distance between the two plates of this capacitor changes, a change in capacitance will result. This change, which is proportional to the pressure, is then converted into a corresponding electrical measurement signal. Here too, an evacuated reference chamber serves as the reference for the pressure measurements. With capacitance gauges it is possible to accurately measure pressures from 10-5 mbar/Torr to well above atmospheric pressure, whereby different capacitance gauges having diaphragms of different thickness (and therefore sensitivity) will have to be used. This measurement principle utilizes the thermal conductivity of gases for the purpose of pressure measurements in the range from 10-4 mbar/Torr to atmospheric pressure. The filament within the gauge head forms one arm of a Wheatstone bridge. The heating voltage which is applied to the bridge is controlled in such a way, that the filament resistance and thus the temperature of the filament remains constant regardless of the quantity of heat given off by the filament. Since the heat transfer from the filament to the gas increases with increasing pressures, the voltage across the bridge is a measure of the pressure. Improvements with regard to temperature compensation have resulted in stable pressure readings also in the face of large temperature changes, in particular when measuring low pressures. Here the pressure is measured through a gas discharge within a gauge head whereby the gas discharge is ignited by applying a high tension. The resulting ion current is output as a signal which is proportional to the prevailing pressure. The gas discharge is maintained also at low pressures with the aid of a magnet. New concepts for the design of such sensors permit safe and reliable operation of these socalled Penning sensors in the pressure range from 10-2 to 1 x 10-9 mbar/Torr. These sensors commonly use three electrodes. A hot cathode emits electrons which impinge on an anode. The gas, the pressure of which is to be measured, is thus ionized. The resulting positive ion current is detected through the third electrode – the so-called ion detector – and this current is used as the signal which is proportional to the pressure. The hot cathode sensors which are mostly used today, are based on the Bayard-Alpert principle. With this electrode arrangement it is possible to make measurements in the pressure range from 10- 10 to 10-2 mbar/Torr. Other electrode arrangements permit access to a higher range of pressures from 10-1 mbar/Torr down to 10-10 mbar/Torr. For the measurement of pressures below 10-10 mbar/Torr so-called extractor ionization sensors after Redhead are employed. In extractor ionization gauges the created ions are focused onto a very thin and short ion detector. Due to the geometrical arrangement of this system, interfering influences such as X-ray effects and ion desorption can be almost completely eliminated. 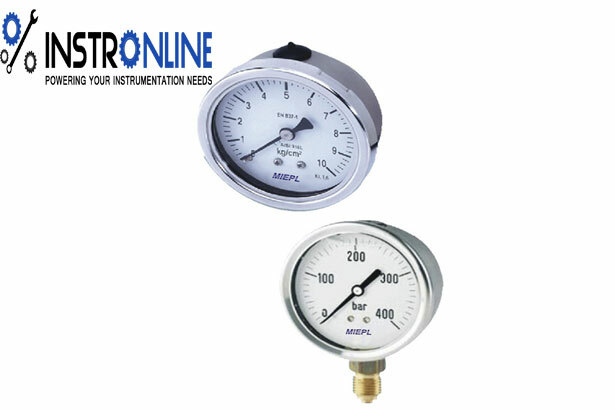 The extractor ionization gauge permits pressure measurements in the range from 10-4 to 10-12 mbar/Torr.